In 1997, my family went to Mexico on the Carnival cruise line. Arriving in Mexico, we were told “don’t drink the water.” Bottled water and soda were bought so that we wouldn’t catch any diseases. We had decided to take an excursion trip to one of the local restaurants. This trip made me sad and has been memorable in my life ever since for more than one reason. On the tour bus ambling up the mountainside, we saw poverty – people living in small crowded huts, children with tattered clothes and no shoes — these dotted the landscape as we passed by in our air conditioned buses. Ironic. We were hustled into the restaurant. “Don’t speak with any locals outside the restaurant or leave this area.” The warnings came more than once. The restaurant, as I remember it, was nothing to speak of really. The locals were friendly but seemed in a hurry as they tried to accomodate the bus loads of people. Looking out the window, I noticed children playing. Other children were standing with sheets of paper in their hands. It looked odd to me. Some children would approach people with these sheets of paper. As directed by the tour guide, the people would not look at them but continue to their tour buses. When it was time to leave, we started the walk to our tour bus but curiosity welled up inside of me. I stopped and looked around to see what these children were trying to hand out. From where I was, it looked like pieces of paper from a coloring book. The children had colored on these and were trying to sell their artwork. My stopped position caught the attention of a little dark skinned boy with pitch black hair. He came up to me and held his picture up. My family stood a little to the side urging me to continue to the tour bus but I couldn’t help myself. I spoke to the boy and admired his artwork. It was obvious he was poor and was trying to sell this to me. My heart felt compassion as I looked into the eyes of this little boy. I would have taken him home with me had it been allowed. I did what I was not supposed to do. I had stopped and looked into the eyes of poverty. And then I took another step closer. Holding the crayon colored paper in my hand, I took out my wallet and handed the boy a dollar. I still can see his little face. His eyes became wide and lit up. His body language said much but his words meant even more “A dollar? For me?” I could hardly believe his excitement. He ran off yelling “a dollar! a dollar!” And then other children started coming out more quickly than before. My husband grabbed my arm and, along with our son, led me into the tour bus. A dollar. Leave a dollar tip on the table these days and you may be scorned or prohibited from entering that establishment again. It’s an insult. Give a dollar to a child in poverty and magic fills the air. I have no doubt that this young boy took the dollar and gave it to his family for clothes and food. I’ve known many Mexicans in the U.S. who do just that — send money “home” to help their families. This cruise left me with a new perspective of poverty and what it’s really like. Growing up in Chicago, I wore hand-me-down clothes and ate oatmeal for dinner sometimes. But we never knew we were poor. Only my mother who had to make ends meet knew the reality. In this part of Mexico, it appears the children know the reality and do their part to contribute to the household income — even if it means selling a page from a coloring book. A few days after returning back to the cruise ship, a virus started circulating through the ship. 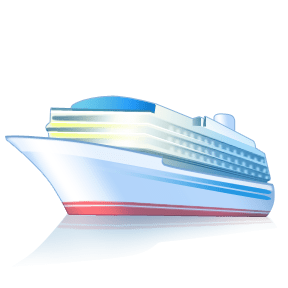 First it was our fellow cruise travelers who fell ill. Then my husband and son were victims and had to stay in their cabins until the vomiting and diarrhea passed. I was not affected but many were. I entered the dining hall one evening and few people were there. I felt lucky. “I must have a great immune system” I mused to myself. But that was not the case. In fact, I’ve never recovered from that trip. More on this adventure in a future blog post. Image courtesy of Microsoft Images.